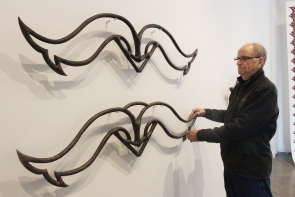 Lethbridge based artist Adrian Cooke explores the design and history of barbed wire in his new exhibit “Chasing the Devil’s Rope,” one of five new exhibits opening at Casa tonight, Jan. 13. “Chasing the Devil’s Rope” features sculpture and computer generated watercolour prints inspired by the shape of barbed wire, reflecting the historical role of the product and it’s design. “ Which was first used as a means of dividing property and controlling and isolating people and animals. Further, it was used as a tool of repression and manipulation in times human conflict. A man-made creation, barbed wire encroaches and divides, transforming our interaction with the landscape,” according to Cooke’s artist statement. “ Some of the pieces go back seven years,” Cooke, said, noting some of the original designs were inspired by the work he did on the decor for Backstreet West. “Barbed wire has political connotations for First Nations and dividing nature But part of what I was interested in was more the design of it,” he said. “ Even the shadows of the pieces are important,” he noted, adding some of the horn shaped pieces have a violent connotation. He created the sculptures with OSB board and a digital printer. Two longer watercolour works were hand drawn, scanned and printed by computer have a wallpaper effect. The larger sculptures are layered OSB board designed like pieces of barbed wire. Cooke worked at the U of L for 28 years in various capacities including with the U of L art gallery. Casa has a number of new art exhibits happening this month. Artists Ed Bader and Peter Greendale explore Alberta in their exhibit “Northwest/Southwest” which opened at Casa, Nov. 4. “Both of them are established artists who earned BFAs at the University of Lethbridge before beginning their art careers,” said Casa curator Darcy Logan. “It is an exploration of Alberta and two different geographic areas,’” Logan continued. “ Ed Bader uses colours and collages to describe northwestern Alberta. While Peter Greendale uses photographs to describe southwestern Alberta,” Logan said. The second half of the main gallery features something completely different— Ethan Roth’ s “Faces and Facades, which includes full sized paper sculptures of familiar cosplay and pop culture uniforms and armour. 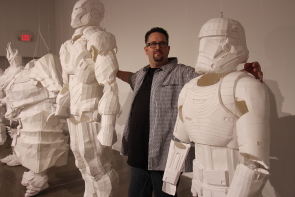 “They are large folded paper sculptures which reflects his love of cosplay,” Logan observed. One familiar sculptures include a Star Wars storm trooper and Iron Man. The others come from Graphic novels and video games. “ There are also two completed ones inspired by the virtual reality game Skyrim he has taken to conventions across the country,” Logan said. To indicate how much work goes into each costumes, there is a breakdown of a seemingly simple cube, which includes several thousand individual components. There are three other exhibitions at Casa. Len Komenac, whose comic strip/ Roy Lichtenstein/Andy Warhol inspired work is often on display at the Owl Acoustic lounge tries something a little different for his exhibit “Small Worlds,” which is on display in the Casa entrance hall. “He’s forced alternate perception to create miniature worlds he has photographed,” Logan said. There are also two exhibits upstairs. Linda Hajash’s “Not to be Toyed With” explores how toys affect genre roles in children. “So she’s altered Barbie dolls to deal with genre roles,” Logan said. This week, Dec. 9 the Southern Alberta Art Gallery opens two new southern Alberta tied exhibits.The new exhibits, Tyler Los-Jones’ ‘a slow light’ and Quebec artists Richard Ibghy and Marilou Lemmens‘ ‘The Golden USB’ run Dec. 9-Feb. 4. Lor -Jones was inspired by bands of strata in the mountains of the Crowsnest Pass reflecting how the landscapes are in a constant state of flux during a 2015 residency and how the people utilized directional at the Gushal Studio in Blairmore. Everybody loves a train. Or is that a cane? Model trains aren’t just for kids anymore. 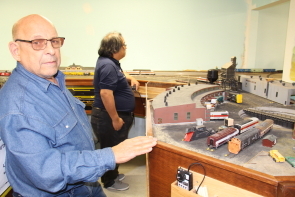 The Southern Alberta Model Train Club welcomes train lovers of all ages, occupations and skill sets. They meet every week to talk trains, play train games, build and paint scenery, lay track and install switches and lighting. The members operate the trains through radio controllers, which can not only operate the switches and send trains on another track, but work the lights and even make the train’s whistles blow. “We have people of all ages to retired adults and people in Grade 12,” said club president Don Cook, watching people trickle in and out of the club’s clubhouse during their fall open house. They also have an open house in the Spring. 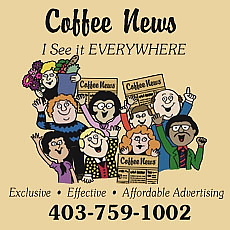 “We have members who are interested in a lot of different aspects. Some are interested in painting scenery, others enjoy laying track and others like installing switches. Others enjoy paining scenery and others just enjoy running the trains,” Cook said, noting the exhibit is always changing as he indicated anew seaport scene in the midst of construction. The club includes operational HO scale and N scale trains as well as a stand alone static G scale exhibit. The centre piece of the clubhouse is an HO scale set in its own room — a full mountain model, featuring a pristine mountain scene, buildings, a working round house and several intricately painted HO Scale trains designed to look like they’ve been naturally weathered. They even have a digital schedule showing when the trains run. Local dancer Macy Obara will join some of the best dancers in the world, representing Canada and Lethbridge, while competing in World Dance Championships in Reisa, Germany Nov. 20-25. “It’s something I have always wanted to do,” said Obara, 14, who has been flying to Langley, B.C. to practice with some of the best dancers in Canada for the competition. She has been working with head choreographer Danielle Gardner and Charlene Hart who is choreographing her duo routine. She is also part of a large group performance. She practices her solo routine at her hometown Studio Exisdance with teacher and owner Janielle Scott, one of several local instructors she works with. Obara is a versatile dancer who does ballet, hip hop, jazz, modern and novelty dancing. She has been dancing since she was four years old. “I started at the University of Lethbridge, but that was for preschool, so I stopped for a few years and started again when I was nine or 10,” she said. “Then she took up gymnastics and went back into dancing,” added proud dad Jeff Obara. “She’s a very well rounded dancer,” said one of Obara’s instructors Taylor Rypien, who has been teaching Obara hip hop dancing for the past five years. Rypien noted they informed her of the opportunity to compete in the worlds and let Obara take it from there. The International Dance Organization has over 250,000 member dancers from six continents. The World Championship format is Olympic-style with only one Gold, Silver and Bronze medal presented on the podium while the World Champion’s National Anthem is played as the top three medalists’ flags are raised. The competition includes children, junior and adult categories. Obara will be competing in several events in the junior (age 12-15) category for both east and west teams.